You keep hearing that old adage, “You are what you eat.” And it has been proven to be true, especially for your skin. A healthy skin needs an adequate supply of nutrients. Indeed, there are some studies which indicate that it is possible to delay aging. Certain key foods can definitely help you out here. Be it wrinkles, dark spots or sagging skin, these foods will help you get rid of them. What’s more? They’re delicious too! So, what are they? Tomatoes are worth much more than just your average salad topping. Packed with vitamin C, they help build collagen to help get a firm and plump skin. They also have the component of lycopene which helps your skin fight UV damage and also improve the cardiovascular functionality. 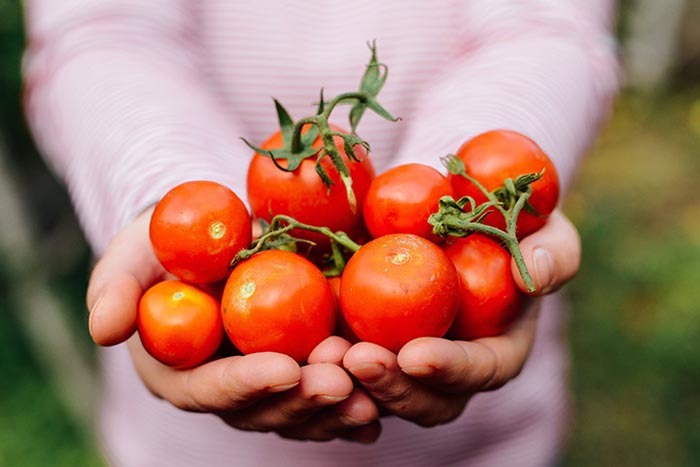 In fact, studies have shown that after a regular six-week tomato diet, all that extra circulation is bound to give you a glowing skin (1, 2) Tomatoes not only contain vitamin C, they also contain a bunch of other vitamins such as A, K, B1, B3, B5, B6, and B7. They help alleviate pimples due to their acidic nature and also act as natural sunscreens. Tomatoes are generally considered botanically as berry-type fruits. However, they are considered to be culinary vegetables, as a side dish or as an ingredient. Berries, and especially blueberries and raspberries contain polyphenols, vitamins, flavonoids, probiotics and lots of antioxidants. They help fight environmental damages to the skin, including anything ranging from damage from pollution to elements in the water to anything environmental that could have a detrimental effect on your skin (3). Strawberries contain omega 3 fatty acids, which help lighten skin tone. To reap the benefits of this wonderful fruit, mix 1 tablespoon of cocoa powder and 1 tablespoon of honey, and apply it to your face. Leave it for 15 minutes to get a glowing skin tone. Berries are often small, pulpy, edible fruits. They are typically rounded, juicy, sweet or soured and brightly colored. 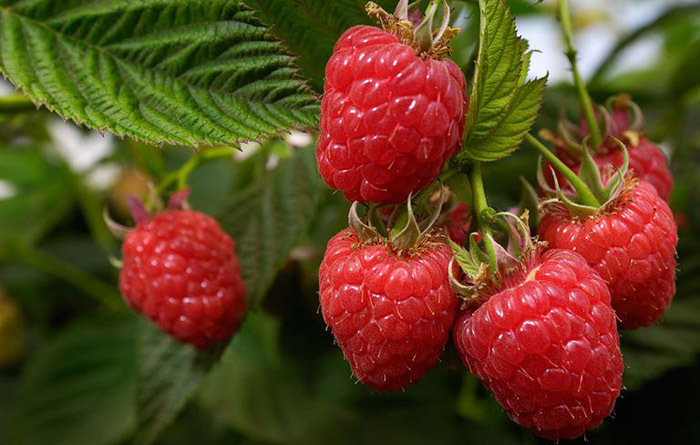 ‘Soft fruit’ is a horticultural term in Britain for such fruits. Skin aging starts when the skin can no longer renew itself, which can lead to wrinkles and skin tags. To support the renewal of skin cells, slightly alkaline blood is necessary. Food rich in potassium, such bananas can help you out there. Apart from potassium bananas also contain dietary fiber, vitamins A, C, K and E, folate and minerals such as calcium, phosphorous and magnesium, which is helpful for exceptional skin healing. 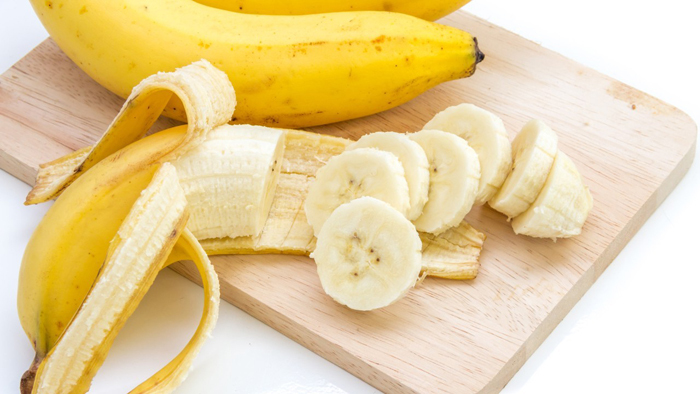 So, make sure you eat a banana every day in order to ensure that your body gets enough supply of these vital nutrients. Bananas are botanically berries. They are usually variable in size, color, and firmness, but are usually elongated and curved, containing soft flesh rich in starch. They may be green, yellow, red, purple or even brown in color when ripe. Sun damage, particularly UVA and UVB damage, which are the contributing factors to skin aging can be a big issue. You really can’t part with sun rays which is why there is Vitamin C to help you out. 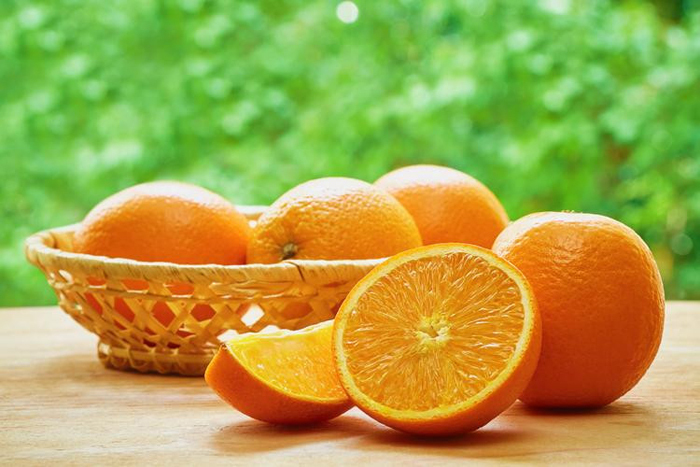 Vitamin C not only helps fight skin aging, it also helps reduce hyperpigmentation. In addition, it also helps build collagen, which is vital to a wrinkle-free, firm skin. Also, the peel of oranges contains antimicrobial and antibacterial properties which further help in promoting a healthy and glowing skin (4). This is one of the primary reasons why experts recommend orange peel and yogurt face pack to instantly rejuvenate your skin. Oranges are generally citrus fruits. There are also sweet oranges, which are different from bitter oranges. Oranges are a hybrid between pomelo and mandarin. Pomegranates are one of the best anti-wrinkle fruits. Packed with Vitamin C, which is great for the skin, Pomegranates also contain ellagic acid and punicalagin, which help undo the damage done by free radicals, and additionally help preserve collagen, respectively. Not only do the antioxidant properties of pomegranates help the skin to create more collagens, they also speed up the process of healing. So, make sure to include pomegranates in your diet (5, 6). Pomegranates are typically found from September to February in the northern hemisphere and from March to May in the southern hemisphere. 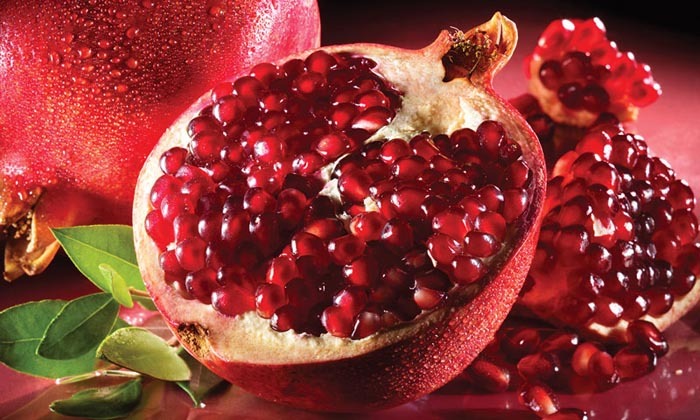 Apart from their use in cooking, baking, and juice blends, pomegranates are also used in garnishes, smoothies and alcoholic beverages such as cocktails and wines. 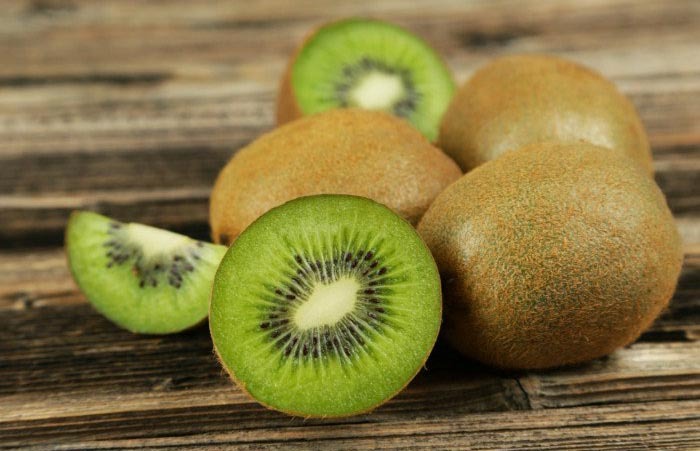 Kiwis are full of vitamins C and E and help prevent skin damage from the sun. Regular consumption has the capacity to prevent the formation of fine lines and wrinkles. 100 grams of Kiwi contains about 154 percent of Vitamin C, almost twice as much as the amount present in oranges or lemons (7). Kiwi fruits are also known as ‘Chinese Gooseberry.’ The most common type is oval in shape and is about the size of a large hen’s egg. With a fibrous greenish-brown skin and bright green or golden flesh containing rows of tiny, black, edible seeds, the fruit has a sweet taste and a soft texture, with a unique flavor. 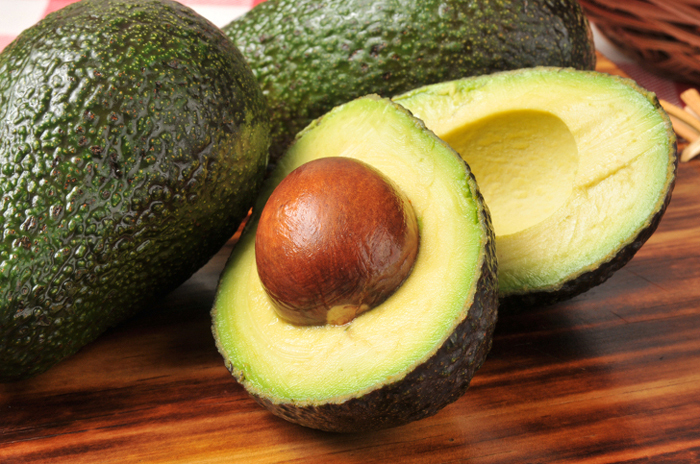 Avocados are rich sources of dietary fiber, healthy fats, and vitamins E, A, C, K, and B6, not to mention, great sources of niacin, folate, and pantothenic acid. Its antioxidant properties help prevent oxidation damage, which in turn helps prevent DNA damage. Avocados also protect the skin from harmful UV radiation of the sun and promote healthy aging, as it is rich in zeaxanthin and lutein. The healthy fats present in avocados not only help in improving your skin’s elasticity, but also work in reducing inflammation and aid in speeding up the wound healing process (8). So, ensure you include fresh avocados in your diet. 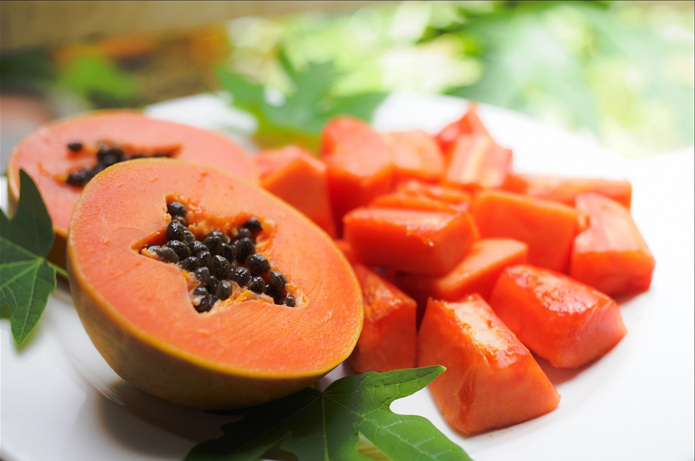 Papayas are tropical fruits containing a lot of essential active enzymes. One such particular enzyme called chymopapain relieves inflammation, a common skin condition. Another enzyme, papain, which helps remove blemishes and treats acme when applied on top of the skin, dissolves pore-clogging fats and helps cleanse the skin. It is so helpful when it comes to your skin. In fact, just one cup of fresh, ripe papaya contains a mind-boggling 144 percent DV of collagen-strengthening vitamin C. This is the reason why papaya is one of the main foods or rather fruits for muscle definition. The papaya, also known as ‘papaw’ or ‘pawpaw,’ is a small, sparsely branched tree, the stem of which is usually single, growing with spirally arranged leaves, confined to the top of a tree trunk. Usually scarred, the lower trunk of the tree is where the leaves and fruit are borne (9). So, these were some of the fruits which could help fight those nasty skin wrinkles and stretch marks. Not only do they help in fighting wrinkles and stretch marks, they have tons of other health benefits as well. Also, they have a lot of other uses, as mentioned above. So, make sure you eat these fruits regularly to maintain not only a healthy skin, but overall good health as well.